In the modern world of technological revolution, REC TEC Wood Pellet Grill takes the lead in communicating this revolution through pellet smokers. To say the least, every single detail about REC TEC pellet grill is an attempt to enrich consumer grilling experience. When you are stranded in between alternatives and your priorities are smart tech and great design, simply turn to REC TEC. Important to realize is the fact that this Wood Pellet Grill is an all-round smoker. This is why we have confidence in your resolution to purchase it. It does not sacrifice quality for beauty or vice versa. Neither does it sacrifice convenience for efficiency. And we have endless reasons to suggest that indeed this smoker is worth purchasing. From the word go, REC TEC Wood Pellet Grill is an incredible smoker featuring smart grill technology. This is the reason why we and indeed everyone who has already used the smoker love it. It is not an easy task coming across such a pellet smoker with a large enough hopper capacity. Yet the smoker features all the latest tech features. Other features such as precise temperature regulation mechanism and great design justify the price at which this smoker sells. Similar to other pellet smokers, this one does not limit you to a specific function. With your numerous needs, you can conveniently grill, bake, sear, bake and indeed perform other processes with this versatile equipment. Best of all, what we have discovered of late is that institutions as well as individuals have actually benefited using this smoker. Added to the fact that it is a long-lasting and promising appliance, it has all the potential to serve you in the long run. Total cooking area: 702 square inches. Temperature range: 180 degrees F to 500 degrees F (82 degrees C to 260 degrees C). Interval of temperature increment: 5 degrees. Construction type: Steel powder coated construction. Product dimensions: 48″ x 57″ x 34″ (H x W x D). 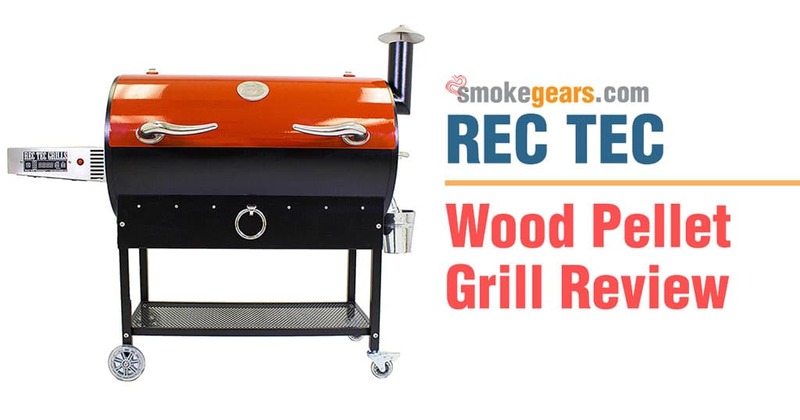 We might not explore all the details about REC TEC Wood Pellet smoker in this single review. However, it is worth mentioning some of its benefits resulting from its notable features. Most notably, the pellet smoker is a renowned smart technology grill which trended on the internet for quite some time. The smart technology has everything to do with automaticity in functioning and temperature control efficiency. As such, the smoker maintains precise and accurate temperature ranging from 180 degrees Fahrenheit to 500 degrees Fahrenheit in 5 degrees increments. Additionally, the smoker features auto-shut off mechanism which assures quality cooking thus, no need to be worried of overcooking. Therefore, you can prepare any of your favorite food using this equipment as long as the temperature you select is within the range provided. Read more about wireless meat thermometer, smoker thermometer and probe thermometer to control temperature. Other than the precision in temperature maintenance, the smoker has large enough hopper capacity. Plus the cooking capacity of 702 square inches, you have an awesome opportunity achieving premium-class grilled meat. Added to the high level of versatility of the equipment, the smoker is fast and efficient. Every time you get into your backyard to smoke, be assured of alluring smell and flavor whenever you cook. Who is Best Suited to Grill With REC TEC Pellet Grill? Lovers of high-tech grilling: REC TEC wood pellet smoker features a number of elements characterized with smart technology. This makes it a perfect smoker for individuals who would like to experience the use of latest technology in the kitchen. If modern technology and automated grilling are your priorities, this smoker does everything faster and more efficiently. Users with multiple cooking needs: You might be in need of versatile equipment to grill, bake, and smoke or do anything a smoker does. Do not waste your time wandering all over the brands, for REC TEC wood grill is your ultimate destination. Home-based users and business persons with diverse cooking needs can simply combine income and get this smoker that assures long-term service. Regular users: Regular users deserve a cooking appliance that can withstand stress and storm whether used by beginners or experts. Likewise, Institutions such as schools and hospitals will find this smoker satisfactory because of the two reasons: the design is compact and strongly constructed, and the cooking space is large enough to be used for bigger populations. Everything about this smoker is a proof on its own that it is indeed and efficient and effective kitchen appliance. Because of the level of technology that this smoker embraces, it is above many other smokers by far. REC TEC wants to assure consumers that its best wood pellet grill is indeed genuine and that it works as expected. Thus, the brand provides 30 day question-free return policy. As an implication to this, you must first of all be 100% satisfied with the smoker to continue using it. And because there have been few cases of return, we believe and trust that the smoker is genuine. In fact, this is supported by excellent customers feedback. In the same line, the price at which the smoker sells is competitive enough. This straight away places the smoker at the top position in terms of giving forth expected results. Large enough to cover diverse needs of consumers. Great design ensures long-lasting performance. Difficult to remove fire pot for cleaning. All said, these features and details are enough to let you know why indeed REC TEC wood pellet grill is worth your money. Whichever your situation and needs, comfort and satisfaction comes with no other smoker than this one. Pellet grills are not cheap, neither should they be, considering the kind of investment the brands make. And for this particular model, we even consider it a rare bargain on your side. Moreover, we have a secret to share. You can make an order from Amazon.